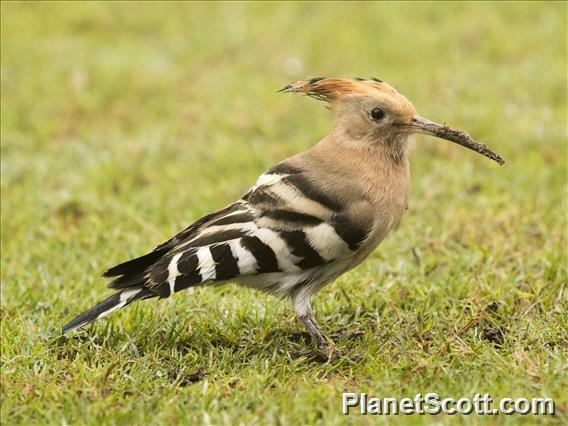 "The Hoopoe is a bird of open country, plains as well as hills upto about 5,000 feet, ft is fond of lawns, gardens and groves in and about towns and villages. Scattered pairs and family parties of four or live birds are usually met with, feeding exclusively on the ground, probing into the soil and amongst the fallen leaves with bill partly open like forceps. It walks and runs on its short legs with a quail-like but somewhat waddling gait. When digging, the crest is depressed and projects in a point behind the head suggestive ol a miniature pickaxe. When the bird is alarmed or excited, the crest is quickly erected and opened lanwise. It flies off in an undulating, undecided sort of way to resettle at some distance whereupon the crest is again raised. The call is a suit and musical, but penetrating, hoo-po, or hoo-po-po repeated several times and often intermittently for over 10 minutes at a stretch. When calling from a branch the bird lowers and bobs its head so that the bill lies almost flat against the breast, the tail at the same time being depressed and turned in under the perch as if in an effort to make both ends meet. At other times the head is jerked forward at each successive call as if barking, and the crest raised and lowered from time to time. Besides this call, it has a variety of harsh subdued caws and wheezy chuckles. Its diet consists of insects, grubs and pupa, it is beneficial to agriculture bv virtue of the vast numbers of insect pests it destroys."